The information that appears on our website about legal matters is provided as a general guide only and shall not be relied on as a substitute for specific legal advice. We try to keep all the information on the site updated, but errors may exist. This site contains links to external websites for your convenience only. The links does not imply that we endorse those sites and we are not responsible for the content of any of those sites. The contents of this website are protected by copyright. 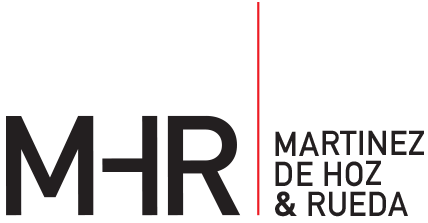 MHR | Martínez de Hoz & Rueda permits users of this site to use its copyright material for their own use but not for publication. However, MHR | Martínez de Hoz & Rueda reserves the right to withdraw any of these permissions in relation to any particular user at any time. Some sections of this website allow you to request information about legal topics and events or contact us to send us your comments or questions. In these cases, we usually store your email address and other data in a database. In no case will we disclose your personal data without your consent to third parties related to MHR | Martínez de Hoz & Rueda, except for our data processors, or in case it is allowed by the current personal data protection legislation. The postal and e-mail addresses and other personal information provided can be used for statistical analysis and to promote our services. If you wish to eliminate or suspend the processing of your personal data by MHR | Martínez de Hoz & Rueda, or suspend the subscription to any of our newsletters or promotional material, please contact us. © MHR | Martinez de Hoz & Rueda. All rights reserved.